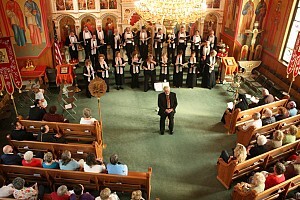 On January 9, 2011, the Church School children performed their Annual Yolka for the parish community. The younger group performed a playette called "Christmas Angels," and the older group performed a playette called "Christmas Cards" for which they created their own costumes. Fr. David entertained all those present with a lively rendition of the "12 Days of Christmas (Muppet-style)," and then we were visited by a special guest: St. Nicholas! A wonderful time was had by all. Christ is Born! Questions? Email them to webmaster@allsaintsolyphant.org.